Wouldn’t it be nice to know what the roads are like before you leave your home? Now you can thanks to the people at the Ohio Department of Transportation. Buckeye Traffic (www.buckeyetraffic.org) provides Ohio travelers with up-to-date information on road conditions, traffic, construction, and other activity affecting roadways managed by The Ohio Department of Transportation (ODOT). Information provided by this site is updated frequently and comes from a variety of sources, such as pavement sensors and monitoring stations, traffic cameras, and through direct input by ODOT personnel. Whereas the information in this site is kept accurate and up-to-date as possible, Ohio travelers should refer to local and regional information outlets and agencies for the latest information during weather/disaster emergencies. This site is maintained by ODOT. Several sites within the Canal Crossing Redevelopment Area require environmental remediation. Image courtesy of Hudconja. In the mid-19th century, industry flourished around the Morris Canal in Jersey City, New Jersey. As transportation technology improved, the canal was filled in and used as a corridor for freight rail and heavy trucks, which led to the establishment of more intensive industries and neighborhoods for workers in the area. By the mid-20th century, however, many industries had abandoned the city, leaving the areas near the canal with obsolete buildings, contaminated soil, and deteriorated neighborhoods. To address the neighborhood decline, Jersey City created the Canal Crossing Redevelopment Area and, in 2009, approved the Canal Crossing Redevelopment Plan. The plan calls for the 111-acre area to be redeveloped as a mixed-use, mixed-income, transit-oriented community designed in accordance with smart growth, new urbanism, and green building principles. The Jersey City Redevelopment Agency (JCRA) took a major step toward achieving the plan’s goals when it was awarded almost $2.3 million in a joint HUD Community Challenge Grant and U.S. Department of Transportation (DOT) Tiger II Planning Grant in October 2010. To read the entire grantee spotlight article at HUDUser, click here. Share: What do you think is important to the region? Over the next 6 months, Cleveland’s Bike Share Task Force will be taking a look at the feasibility of bike sharing and reviewing recommended business models for operating a system in the city. Building off of recent momentum in cycling and complete and green streets, the Mayor’s Office of Sustainability issued a Request for Proposals in autumn 2012 and has contracted with Toole Design Group (TDG) as the lead consultant for this project. Current bike share systems operating in the United States. Click for an interactive map. Why Now? Bicycling in Cleveland is on the rise. The most recent American Community Survey indicated an increase of 280% from 2000 to 2010 of people commuting to work by bicycle. Numerous bicycle-related businesses and services have opened in the City, including a commuter bike parking station, The Bike Rack. This past September cyclists and civic leaders created Bike Cleveland, a unified bicycle advocacy organization serving greater Cleveland. 1. The first Complete and Green Streets ordinance in the state that requires road projects to incorporate best practices in Complete Streets and Green Infrastructure. 2. The Bicycle Transportation Safety ordinance that includes provisions to make streets safer for biking and walking, including a 3-ft passing requirement. Benefits of Bike Sharing: Bike-sharing in urban areas can positively affect how residents, employees, and visitors experience a city. Bike-transit systems allow for more people to access cycling for short trips, replace vehicle use, cycle for fitness and recreation, and for tourists and residents alike to explore a city. Project Details: The Bike Share study is divided into two sections: a feasibility study and, dependent on the results of the feasibility study, an implementation plan for a flexible and automated on-demand bicycle sharing system. The feasibility study will include locations and sitings, integration with the existing transit system, technical discussions, and best practices. The feasibility study will incorporate public engagement in order to gather data about public interest and public feedback pertaining to bike sharing in the City. We anticipate the engagement process will address the particular needs of geographic areas of the City and the transportation network. Cleveland is looking forward to launching this project this month and determining if and how bike sharing can be a beneficial option for Cleveland’s citizens, commuters and visitors provide economic development opportunity and reduce our city’s carbon footprint. At our board meeting yesterday, the Northeast Ohio Sustainable Communities Consortium Board elected a new slate of Board officers and members of the Board’s Executive Committee. These officers will lead the organization throughout 2013, the final year of the initial, three-year federal grant. A number of Northeast Ohio Transit Agencies have begun to look at alternative ways to fuel public transportation. Last year, Stark Area RTA unveiled their new Clean Natural Gas system used to fuel a number of new buses at SARTA. CNG is the Cleaner, Greener, Domestic and more Affordable option. Reduces health-harming air pollutants - 95% less particulate matter, carbon monoxide emissions and 80% less nitrogen oxide emissions. (U.S. Department of Energy National Renewable Energy Labratory). Lowers greenhouse gas emissions by 26-29% in cars and light trucks and 23% in medium to heavy-duty vehicles. 98% of natural gas is produced in North America; reducing our dependence on foreign oil. Costs 25-40% less than diesel fuel (1/3 of the cost of traditional gasoline), has maintenance costs equal to or less than gasoline or diesel vehiles. SARTA will see a savings of over $300,000 per year by making the switch. The Greater Cleveland Regional Transit Authority has teamed with NASA Glenn Research Center to bring the bus to town and keep it refueled at a bus garage in East Cleveland. The setup is among only a few in the country, supported in part by a federal program testing the practicality of hydrogen-fueled buses. They run cleaner, quieter and more efficiently than diesel-fueled coaches. Lowering transit demand for diesel and other fossil fuels could help lessen dependence on foreign oil, advocates say. And sparking demand for buses running on hydrogen fuel cells could boost a fledgling industry. RTA acquired the distinctive, green-and-white bus for up to a year. It’s a no-cost loaner from United Technologies Corp., a Vermont-based company that makes fuel cells. The company is working with the Federal Transit Administration to test the performance, operating cost, reliability and safety of the buses. They cost a lot more than conventional coaches. RTA’s bus seats 57 and will roll up to 80 miles a day. The transit agency will cover operating costs and has already paid NASA Glenn and its contractors $50,000 to install the fueling equipment. 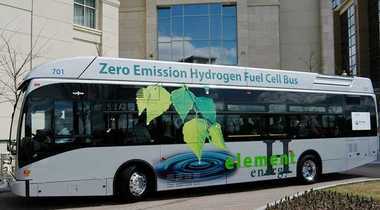 Local advocates of alternative energy have pursued the hydrogen-fueled bus for several years. The Cleveland Foundation supplied a grant that helped NASA Glenn and the Ohio Aerospace Institute ship in a hydrogen-fueling station once used in Vermont. Crews also installed an electrolyzer from Kennedy Space Center in Florida. The device separates hydrogen from water, allowing the gas to be stored at the fueling station and pumped into tanks aboard the bus. NASA pioneered fuel cell technologies 50 years ago for manned space flight. “We’re hopeful that we show to the community how straightforward it is to deal with hydrogen and how simple and effective it is,” said Valerie Lyons, chief of NASA’s power and in-space propulsion division. Sierra Lobo, a NASA Glenn contractor, installed the fueling station at RTA’s Hayden Garage in East Cleveland. That facility already had equipment for compressed natural gas. The station will feature 50 hydrogen sensors developed by NASA Glenn, Case Western Reserve University and a California company. Sustainable Cleveland 2019 (SC2019) is a 10-year initiative launched by the City of Cleveland in 2009 that engages everyone to work together to design and develop a thriving and resilient Cleveland that leverages its wealth of assets to build economic, social and environmental well-being for all. Every year leading up to 2019, Cleveland will focus on one of the key areas fundamental to a sustainable economy. The Sustainable Cleveland Celebration Points are designed to be accessible to all members of the community — households, neighborhoods, businesses, and institutions can all participate, either in collaboration or independently. The winds of change… come and join us. Learn how Advanced and Renewable Energy works in Cleveland and Northeast Ohio. Learn about solar, wind, hydrogen, fuel cells, bio-energy, energy efficiency and more! Stop by informational tables to hear how you can save money and reduce your energy consumption at work, home, and in your community. Also come taste samples and purchase your new favorite healthy foods on site. The event is FREE and easily accessible via RTA. Parking available at the Willard Garage at regular price.